Deep Purple Dreams. Photograph: ©Alison Lee Cousland. After working with many traditional art modalities: painting, drawing and printmaking, mixed media and photography, environmental sculpture and ephemeral art ~ My art making has now become far more attuned to working directly with nature. I also work with arrangements of these and other natural materials in earth, sand, water and ice. The creative process is similar ie start with one element, pause, and see what it needs ~ However the tangible processes vary. Adapting to suit the medium. During the creation of my artscapes the process is all embracing and incredibly magical. Thoughts of anything else are silenced. I fall in love with the individual pieces of nature, fresh or faded that I’m using and then how the different elements can greet, merge, compliment or contrast with each other. I’ll describe some of the processes involved with the production and photography of individual works in my future articles. Hundreds of photographs are taken at the different stages of any one artscape, that can’t possibly capture the actual beauty I see with my eyes or the feelings felt while adding and removing, arranging and rearranging components. As selected photographs are given just a touch of Lightroom magic, I watch them give form to new expressions, that often can be enhanced by other ideas/thoughts/words that come to me, as I look at the image. Words based on the actual image and the symbolism of the elements that have been used are manipulated, as a collage of words, into short ‘poems.’ Words are also based on what has been or is happening in my day/week/month/year/life: A quote I’m drawn to, a comment on a social network, a spoken word ~ Whatever I am sensitive to in my surroundings at the time. Sometimes the resulting ‘poems’ show me aspects of a piece that I couldn’t see before. As do comments from other people ~ Who may see and add another layer from their own reality. 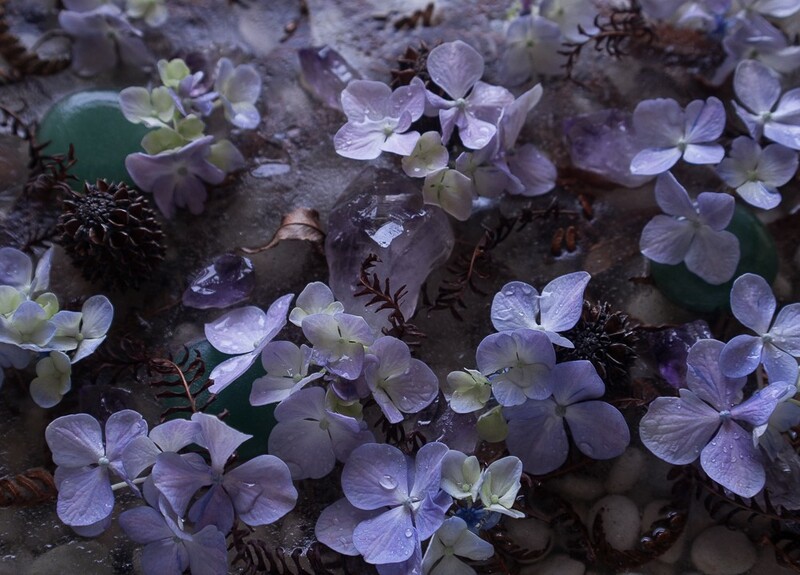 When the beauty of purple amethyst and hydrangea flowers on a bed of ice covered with dried fern fronds and silky oak seed pods speaks to you ~ I’ll be most delighted to hear your thoughts. Originally published at www.allyinspirit.info on December 23, 2016.